placed me on your chest. on the day I was born I was too tiny to hold. before the nurse took me away. were cloaked in institutional plastic. I waited for you behind glass walls. Eight weeks in an incubator. a crib lined in pretty plastic bars. 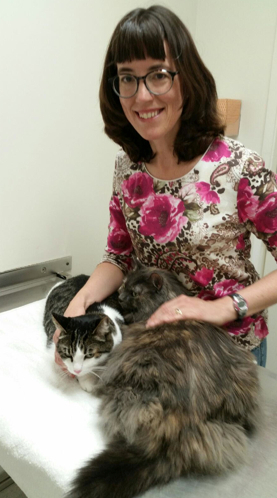 PHOTOGRAPH: The author at Canyon Animal Hospital, Laguna Beach, California, with Ashley (left) and Misty (June 2, 2015). NOTE FROM THE AUTHOR: I wrote this poem because of a cherished memory I have of my mother telling me that I was named Robin Dawn instead of Dawn Robin because “You looked like a little bird,” and once she saw how small and birdlike I was when I was born, the decision to name me Robin was an easy one. I love my name, Robin, and I love how nice it sounds when coupled with my middle name, Dawn—a name that hints of birds in springtime and beautiful mornings (Dawn), a name with lovely references to nature. As a premature infant, my entry in the world was very hard on my mother, who had to wait for two months to take me home from the hospital and hold me like a normal child. Though I don’t remember it now, being an incubator baby must have been hard on me, too—a baby who spent the first two months of life with very little human contact, and no chance to be held and cuddled by my mother. But in spite of this difficult beginning, I have my beautiful name, and I have always had my mother’s love—both gifts I cherish. ABOUT THE AUTHOR: Robin Dawn Hudechek received her MFA in creative writing, poetry from UCI. Her poems have appeared in numerous publications including Caliban, Cream City Review, Blue Arc West: An Anthology of California Poets, Cadence Collective, Hedgerow: a journal of small poems, Silver Birch Press, Right Hand Pointing, and work forthcoming in Chiron Review. She lives in Laguna Beach, California, with her husband, Manny and two beautiful cats, Ashley and Misty. More of her poetry can be found at robindawnh.wordpress.com. 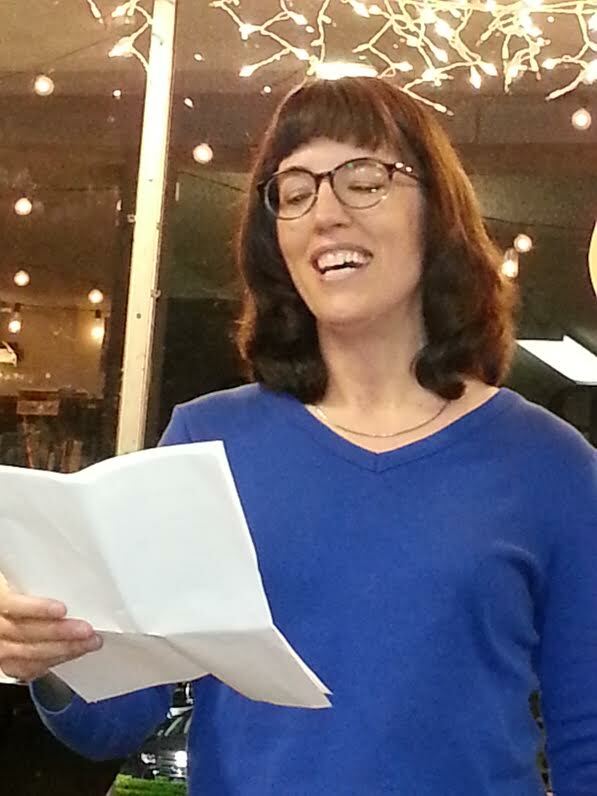 Author photo: Robin Dawn Hudechek at the Cadence Collective reading at Gatsby Books, Long Beach, California (May 11, 2015). Robin, your poems never fail to surprise me and delight me. I love the story behind and in this poem. Preemies do seem to be almost “like glass” and fragile, don’t they? The image of you as the baby bird crouching in the corner of the crib really touches my heart. I know your mother must love this poem.